We have known for decades that scientists can learn about local climate conditions by studying the growth rings in trees. Wide rings form in warmer years with more precipitation; thinner rings indicate a colder, dryer growing season; and scars provide evidence of external environmental factors, such as forest fires and insect infestations. It turns out, however, that a similar record of local climate can be found in the ocean. Foraminifera (or forams, for short) are a group of single-celled organisms, most of which are between 0.1 millimeter and 1 millimeter in length, or about the size of a grain of sand. Found in all parts of the world’s ocean, forams are often among the most abundant shelled organisms in the marine environment, and have even been found in the fossil record dating back over 500 million years. This summer, Yale University doctoral student Janet Burke partnered with a BIOS scientist and others to study forams and learn what their shells—called tests—can tell us about local climate conditions, such as ambient water temperature. Although most forams have shells built from calcium carbonate, similar to corals and crustaceans, others are composed of silica or aggregations of readily available materials like quartz sand. The larger, more complex species feature tests with multiple chambers that are added during growth, and many tests contain small pores, as well as larger apertures through which sticky feeding “arms” extend. Burke and other biological oceanographers believe these pores may play a critical role in the gas exchange between forams and the surrounding seawater during respiration and photosynthesis. In a study published earlier this year in the journal Biogeosciences, Burke and a team of her colleagues examined the pore size, density, and porosity (the ratio of pore area to the organism’s total surface area) in a variety of foram species found in sediment cores from the North Atlantic Ocean. In addition, they also conducted laboratory experiments, growing a single species of foram in three different temperature conditions. Similar to the annual rings in trees, the shells of tiny planktonic foraminifera can give scientists insight into local climate conditions. The foraminifera (or forams) are single-celled organisms, most smaller than a grain of sand, with calcium carbonate shells. Seen here under microscope magnification, the shell of the foram (round portions) is visible, as well as the long, delicate protruding feeding appendages. Also visible is the brine shrimp (darker brown, oval shape) being consumed by the foram during a long-term laboratory investigation. In both sets of forams they found that pore size and porosity correlated with habitat temperature; specifically, that larger pores with higher porosity are found in forams living in warmer waters. From a physiological perspective, this makes sense, as warmer temperatures increase metabolic rates and reduce the oxygen concentration in the water, leading the forams to develop larger surface areas and more pores to facilitate increased gas exchange. However, and perhaps more surprisingly, they also discovered that porosity is a plastic trait, meaning it can change in response to changing environmental conditions. “Our results from the laboratory experiments were really exciting because they show that morphology, or the physical characteristics, of foram shells isn’t just genetic, but that it can also be influenced by the environment,” Burke said. This is important because genetic information about planktonic foram species is difficult to obtain, leading scientists to rely on minute features of the shell to identify specimens to the species level. Understanding the extent to which shape can be influenced by the environment alone is key to proper classification and improving scientific understanding of foram evolution and ecology. Because temperature-sensitive oxygen isotopes from the seawater are incorporated into foram shells as they grow, the shells reflect the chemistry of their habitat, much like the rings of a tree reflect the environmental conditions from year to year. To measure these isotopes and infer past temperatures, scientists conduct time-consuming and expensive chemical testing of fossilized foram shells. Using the physical characteristics of foram shells, scientists like Burke can gauge the biological response to environmental conditions, providing a means for understanding how Earth’s long-term climate changes have affected plankton communities through the study of fossilized forams. 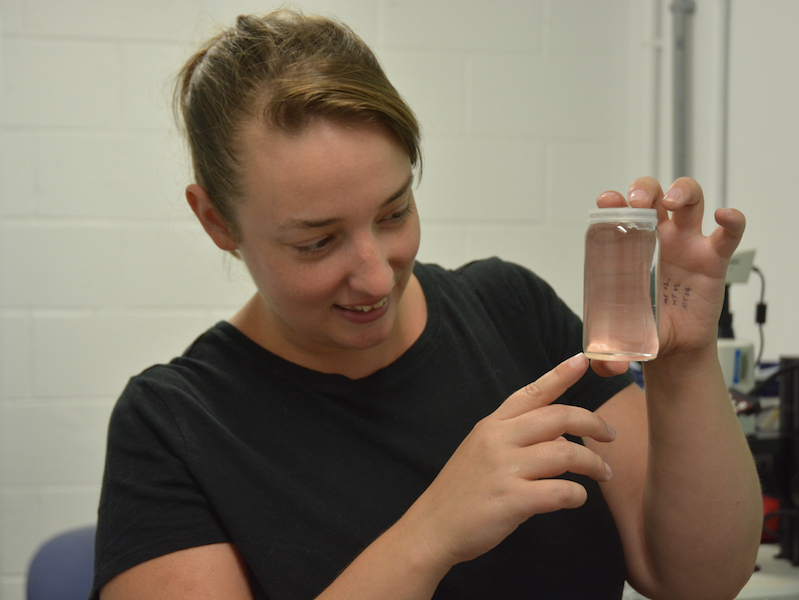 Janet Burke, a doctoral student at Yale University, is part of a team investigating how foram shells develop in response to changing environmental conditions, such as water temperature. 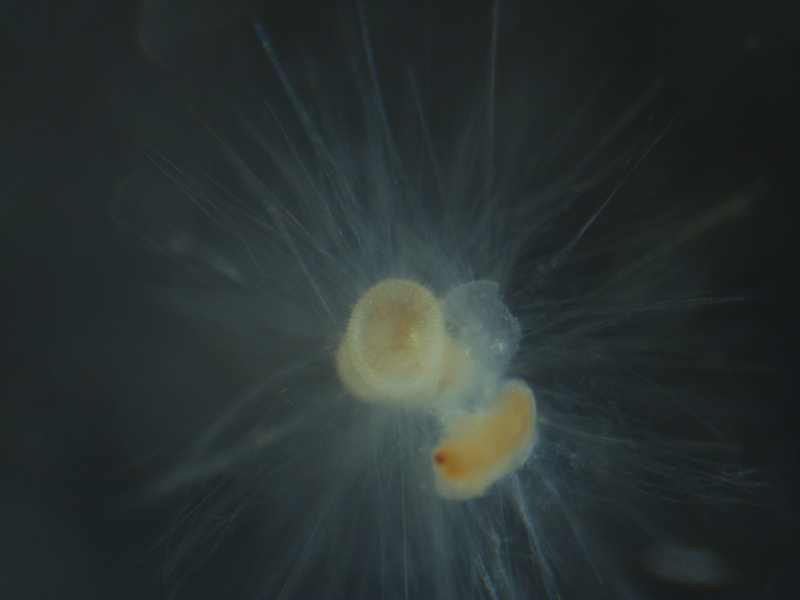 Their results have shown that physical characteristics of foram shells aren’t genetically determined, as previously thought, but influenced by the marine environment in which they develop. Over the summer, Burke and Daniel Gaskell, a Yale doctoral student specializing in marine micropaleontology, used the environmental change research facility (ECRF) at BIOS to continue their research into the role of the environment in shaping the porosity of individual forams. Amy Maas, a comparative physiologist and biological oceanographer at BIOS, was a co-author on Burke’s Biogeosciences paper and facilitated the students’ use of the ECRF during this investigation. During their six weeks at BIOS, Burke and Gaskell collected forams on a weekly basis, carefully separating them from other planktonic materials captured in nets towed behind one of BIOS’s smaller research boats. On a good day, Burke said they would collect anywhere from 100 to 150 forams, which they would then feed and maintain in the lab over the course of a week (this also happens to be the average lifespan of a foram from the time of capture). Each day, Burke and Gaskell conducted the tedious task of feeding individual forams brine shrimp with the assistance of a high-powered microscope and a syringe. They measured and photographed each foram under the microscope to monitor and track daily growth. According to Gaskell, forams add new chambers every few days and, because new ones are built on top of old ones, each new chamber represents a significant jump in the size of the foram. Throughout the week, the scientists exposed their collected forams to three different temperature treatments, as well as varying amounts of shade. Burke explained that many forams contain symbiotic, photosynthetic algae within their tests, much like corals. Monitoring foram development under different light conditions goes another step further in understanding the relationship between test morphology and environmental variables. “It’s pretty amazing that, even though forams only live for a week, we can see instantaneous change in the total porosity within the lifetime of an individual,” Burke said.